As I’ve said a few times, I’m a Buddhist, since 1986. Therefore, Easter, Passover, and most other holidays aren’t part of my individual faith. However. . .that doesn’t mean I ignore them, especially if there’s food involved. I mean, why? No need to be rude if someone offers you a macaroon or king cake or something. . . . I grew up Catholic. Didn’t meet anyone Jewish until I went to college. At Loyola in New Orleans. What I know about kosher is what folks have told me over the years (and the bits I’ve seen on TV), like what kosher salt is really for. (Of course I use it–doesn’t everybody?) I’ve never been to a synagogue. The only reason I know about Rugelach is because they’re in Barefoot Contessa Parties on page 69. I mean absolutely no disrespect to anyone who is Jewish. I am only proclaiming my lack of information about Judaism, particularly as it relates to the culinary arts. Nothing more, I promise! Imagine my thoughts when I came across Raspberry Rugelach. 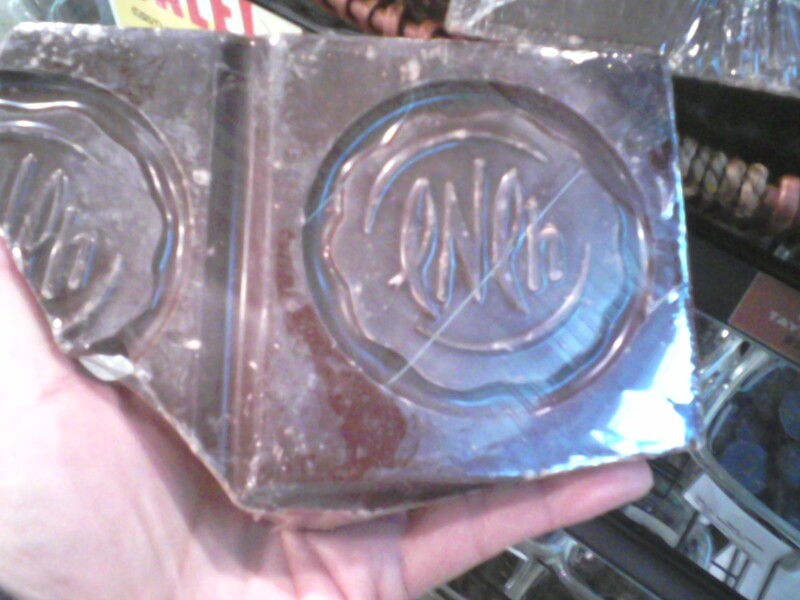 I saw them in Central Market on Friday, and I *almost* got some, but. . .it had wheat flour in it. Raspberries in dough? Oh, yes. . .but are they kosher for Passover with flour in them? I asked the lady next to me if she was Jewish. Well, if she was, then she would have known if the rugelach was kosher. But she wasn’t, and she didn’t. Maybe next year. The cream cheese threw me off–I thought to be kosher for Passover it couldn’t have flour. Maybe that’s Hannukah or Yom Kippur. Again, I’m the *last* person to ask about that sort of thing; I was just hoping for no flour. In the same book on page 176: Apple Crostata, a delicious dessert that’s good any time of year. (It too has wheat, in the form of flour.) I’ve never had anyone turn it down. Me included. Hey–it’s for special occasions. I’ve taken it to Thanksgiving a couple of times, and to a birthday party once–there is rarely any left. I think a couple of years ago I had one slice left and gave it to my neighbor, who finished it off quickly and enjoyed it as much as everyone else did. I don’t remember the brand, but I can tell you it’s fancy, possibly from France. This weighed at least 2 pounds and was nearly the size of a brick. This is not a candy bar. Well, not in the traditional sense, but it is for me. Trust me when I tell you I sent this picture to my neighbor, and I was SOOO tempted! this brick is about $10, if I remember correctly; might have been $15. She texted back, “Don’t.” I didn’t. But I thought about it real hard. That’s a lotta chocolate, and even Giada de Laurentiis would be hard pressed to resist. If someone left that in my Easter basket, I’d be all over it. And I’d put it in a locked safe, too. IT’S MINE!!! 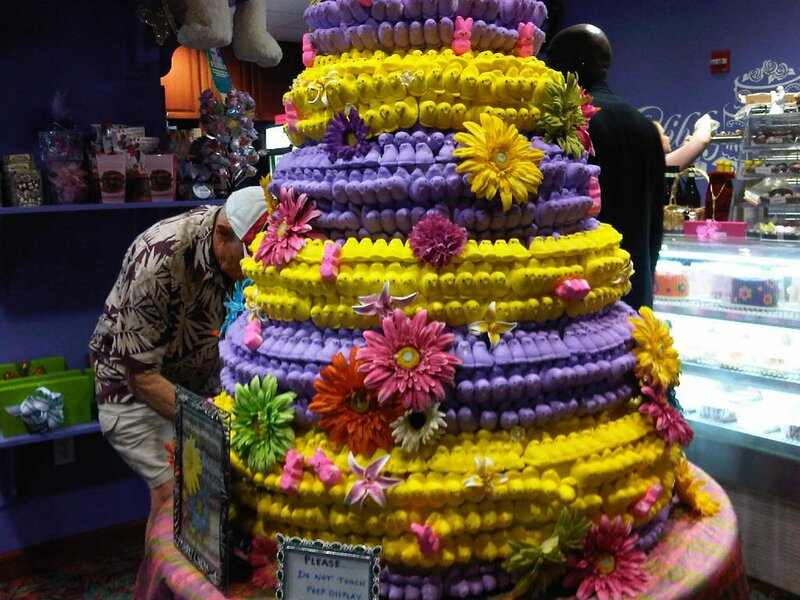 Yes, dear readers, those are hundreds, if not thousands, of marshmallow Peeps, in what one might call a “sculpture,” or as they called it, a “display.” Whatever you call it, that’s a lotta Peeps. OMG. I’m not a particular fan of them, but I HAD to take that picture. It was absolutely gorgeous, and about 10 or 15 feet high. Heck, I didn’t measure it, but it was way taller than my five-foot-three frame. It was huge–and it was a little bitty store! I forget what kind of chocolates I bought, but it was just a couple, and of course, handmade and very delicious. Speaking of Easter. . .my mother used to tell the story that her engagement ring was a true surprise hidden in a chocolate Easter bunny, and she nearly threw it away. Whoops. . .fortunately, somehow, a very expensive diamond ring (very 1950’s) was saved and the folks got married some time after that. They’ve been married something like 55 years now. It’s been many years since I’ve had a chocolate Easter bunny, much less an Easter basket, but that’s OK. Sometimes when I’m having a day. . .only some chocolate will do, you know? And on Monday, all the Easter candy goes on sale 50% off. The thrifty mother will have a secret freezer to stash them in so that the kids don’t know when she bought it. The chocoholic will simply go shopping and make himself or herself very happy. I’m going to try and behave myself. Happy Easter, Passover, and Happy Dining!